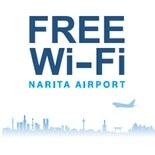 Free Wi-fi is available throughout the Narita terminals. Narita International Airport in Narita, Chiba Prefecture, outside Tokyo, began offering free W-Fi throughout its passenger terminals starting on April 26. The move marks a major step up from the gradual expansion of free internet connectivity the airport has been implementing, now allowing visitors in the passenger terminals' public areas to use the service. The new areas are: the domestic route area and international departure passageway in Terminals 1 and 2; the shopping areas on the fourth and fifth floors of Terminal 1's Central Building; and the shopping area on the fourth floor of Terminal 2's Main Building. In conjunction with the expansion, the airport has also changed the SSID to "FreeWiFi-NARITA." There are "FREE Wi-Fi" signs posted around the airport to promote Narita's efforts to offer travelers greater convenience.